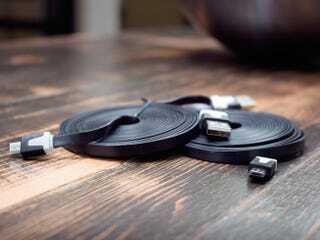 Most micro USB cables are a dime a dozen, but these ultra-handy ones are designed to make charging and syncing your devices crazy convenient. At 10 feet in length, you can literally charge from across the room. Right now, Jalopnik readers can pick up a 2 pack for 40% off - just $14.99 + free shipping. It pays to have some spare Micro USB cables around - they power most phones and portable devices not made by Apple. These 10 foot cables give you the freedom to charge from nearly anywhere, so you don't need to wait next to an outlet while your phone slowly charges. Their sturdy, flat design ensures they won't fray, tangle, or break. To pick up your 2 pack, head to the link below. Shipping is free to the US and just $5 more worldwide. Head for the link below to take advantage of this great deal.